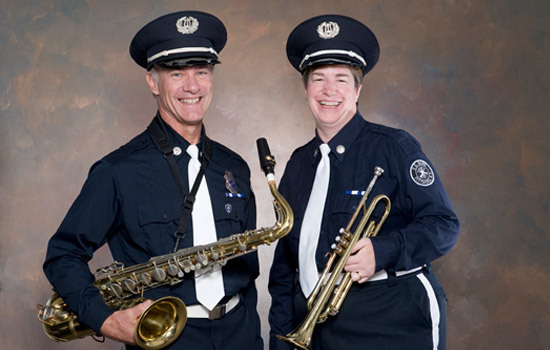 Bob Kremens, research associate professor in the Chester F. Carlson Center for Imaging Science, and Heidi Miller, professor and director of the physician assistant program, perform with the Pittsford Fire Department Band. The first few bars of a Sousa march can transport a crowd to a different era in seconds, evoking something wistful, nostalgic and quintessentially American. It’s probably not surprising that community bands have kept marching right into the 21st century and remain crowd pleasers. If you look closely, you’ll find two members of the College of Science in the Pittsford Fire Department Band. Heidi Miller, professor and director of the physician assistant program, and Bob Kremens, research associate professor in the Chester F. Carlson Center for Imaging Science, clock in miles of marching (and standing) during the band season, from March to December. It all starts with the St. Patrick’s Day parade (rain, sun, sleet or snow), and picks up speed around Memorial Day and into the Fourth of July and beyond, with community concerts, parades and festivals. Kremens—who started playing saxophone “after a 25-year hiatus”—has the unique distinction of being the only musician in the band who also knows how to put out fires. Kremens joined the Pittsford Fire Department in late 2004 and won the Pittsford firefighter of the year “Chief’s Award” in 2008. A proponent of civic volunteerism, Kremens chaired the Pittsford environmental board and served on the planning board for many years prior to joining the band. While being a resident of Pittsford is a requirement for the fire department, it isn’t required for band membership. In fact, many of the approximately 50 professional and amateur musicians in the band—about 30 of whom are “very active”—hail from around the county. Miller, a trumpet player from Penfield, won “Rookie of the Year” last year for her dedication and performance. Like Kremens, Miller—who had played French horn through college—hadn’t picked up a brass instrument in nearly 25 years. You can hear the band play at the Mendon Station Park Festival at 1 p.m. Saturday, Sept. 11, and at the Memorial Art Gallery’s Clothesline Festival at noon Sunday, Sept. 12. The Pittsford Fire Department Band will also perform at the 14th Annual Rochester River Challenge Wounded Warriors Disabled Sports Project Event at 11:30 a.m., Saturday, Sept. 18, at the Genesee Waterways Center, 149 Elmwood Ave. For additional performance dates, visit http://www.pittsfordfdband.org. Drones are adding a new level of precision to agriculture, giving farmers digital tools for cultivating better and more profitable crops.